Comp points is real money! New players at William Hill have a number of bonus offers to take advantage of. First of all, you’ll get 150% up to £150 on your first deposit, which is the standard bonus offer promoted on the site. However, mid-rollers can get a bonus up to £350, high rollers a bonus up to £500, and VIP players earn a whopping £1,000 first-deposit bonus. After this, all existing players have the possibility to clear a £500 second deposit bonus and then earn a monthly £100 bonus for one year. All added up, this becomes a very interesting bonus deal. Since you’re able to choose what first-deposit option you will go for, chances are that you’ll find a promotion that suits your bankroll perfectly. William Hill is one of the world's leading betting companies and has traditionally specialized in off-track betting. Their arrival on the online casino scene has been, as you'd expect from such a gambling heavyweight, rather successful but not without its hiccups. Payouts here are fast and all the major currencies are supported. Customer support is good and overall, transactions and this side of the operation run very smoothly. William Hill has a lot of experience in this area so this is hardly surprising. As far as playability, William Hill casino is definitely good, but other sites are better. They use Boss Media software and while the graphics have room for improvement, the site, nonetheless, gives off a rather “classy” feel. In an industry dominated by Playtech and Microgaming, you might expect William Hill to suffer a bit in terms of games, but their game selection is actually pretty good at more than 100 games and several progressive jackpots. 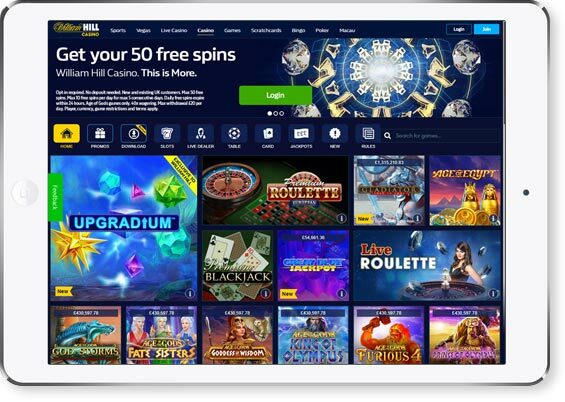 Overall, William Hill's experience in the gambling industry makes their online casino a reliable choice for players searching for a solid all-around experience and perhaps a change of pace from other sites run on Playtech and Microgaming software. They've even become the fastest UK based internet gambling site online and that's not the result of dumb luck. So, to sum up, we'd certainly recommend giving William Hill Casino a chance and, at the very least, and will be keeping an eye on its progress.